The Field Spaniel was developed in England during the latter half of the 19th century to fulfill the demand for an all black, medium-sized, well-boned dog adept either at working in dense cover or in retrieving from land and water. For a time there was considerable interbreeding among all varieties of spaniel, and the progeny that resulted were usually registered under the variety they most resembled. Eventually, with the advent of more formalized dog shows, spaniels under 25 pounds were recognized as Cocker Spaniels, large liver and white or black and white dogs became known as English Springer Spaniels, and the solid color dogs over 25 pounds retained the name, Field Spaniel. The first Field Spaniels in the United States were listed with the American Spaniel Club in the 1880s and registered with the American Kennel Club (AKC) in 1894; by the end of the 1920’s the breed had disappeared from the AKC registration books. Field Spaniels were returned to the United States in 1968 when R. Squire and C. Tuttle imported three from England. These three Fields and subsequent imports form the basis for the majority of Field Spaniels presently in the United States. The Field Spaniel Society of America was formed in 1978 and is recognized by the AKC as the parent Club for the Breed. The modern Field Spaniel is a sturdy, medium-sized spaniel averaging 18 inches in height, and weighing from 40 to 55 pounds. Well balanced in bone and substance, the Field is larger than the English Cocker, yet smaller than the English Springer. The hair coat is long, flat, glossy, and silky in texture, with good feathering on the chest, body, and legs. Colors are Black, Liver, or Roan, or any one of these with tan markings. An active, friendly dog, the Field is loving and eager to please. They are excellent with children and other animals but can be somewhat reserved with strangers. Alert and able to bark an alarm, Fields are not guard dogs, nor are they dogs for those with “House Beautiful” aspirations. Though seasonal shedding is only moderate, their large, heavily webbed feet testify to the breed’s fondness for water, and their drinking habits often leave the floor around their bowls swamped. True to their retrieving nature, Fields love to carry objects around in their mouths. They also like to travel, tend to snore, and can have a very diverse vocal range. To be at their best, young Fields should be trained and allowed to experience as many non-threatening situations as possible, including meeting a variety of people and animals. Although in recent years there has been virtually no selective breeding for hunting ability, the Field remains a fine working spaniel. When trained, the Field will quarter in dense cover to flush birds, such as pheasants, quail, and chukars, with ease and will retrieve them with a soft mouth. The excellent nose and independent spirit of the Field make them a joy as hunting companions. Fields currently compete in field and water tests, and tracking. 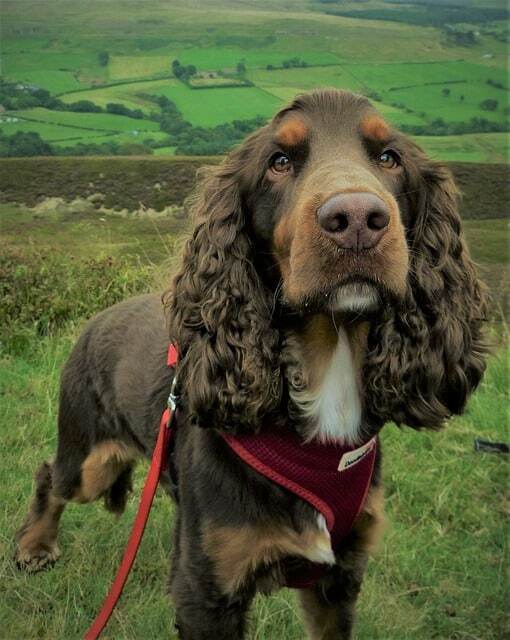 Most Field Spaniels enjoy showing and are excellent for someone who wants an attractive medium-sized dog without a lot of grooming. The Field is also an excellent choice for owners who want to handle their dog themselves, since it is possible, if there are enough dogs in their region of the country, for an owner-handler to finish a Field to a championship. A number of Fields have placed in the Group Ring. Training a puppy for showing may begin as early as 8-12 weeks. As with any puppy training, care must be taken not to over-train or over-show. Like many spaniels, Fields are very bright and active dogs and if not trained may well become bored and get into mischief. However, the same independent spirit that makes the Field a good hunting dog can make obedience training an interesting challenge. If trained with positive methods at the correct age, a Field can be a happy, high-scoring worker. The natural reserve and placidity of Fields also make them excellent for therapy dog work. Fields are less coated than the majority of spaniels, and one kept as a pet requires little grooming. Besides being cleaned and brushed, all Field Spaniels need their toenails, the hair between the pads of their feet, and the hair inside their ears clipped. The pad and ear clipping are not only more attractive, but the shorter hair dries more quickly, which helps prevent the development of eczema. Field Spaniels that are shown require more grooming. When presented to the dog show judge, a well-groomed Field should look natural. Clippers are used only on the head and the front of the neck, and any other grooming is done with thinning shears and stripping knives. Overall, Field Spaniels enjoy very good health. When health problems do occur the two most common health problems encountered are hip dysplasia and thyroid disease. Of course, all dogs should be checked regularly by a veterinarian, kept up-to-date on all shots, including parvovirus, and kept on a heartworm preventative. Hip dysplasia, the most common skeletal defect in dogs of all breeds, is an inherited condition that results from a poor fit between the ball and socket apparatus of the hip joints. Symptoms range from none to severely crippling and there is no cure. All Field Spaniels, but especially those used for breeding, should have their hips x-rayed. Thyroid disease is not a life-threatening condition, nor does it necessarily result in a loss of quality of life. Symptoms can include weight gain, lethargy, poor coat, and/or scaly skin. Confirmation is made via a blood test and treatment requires daily medication. Other conditions that occur occasionally in Fields are Progressive Retinal Atrophy (PRA) and Sub-Aortic Stenosis (SAS). PRA is an incurable disorder that leads to blindness. Once again all Fields, but especially those used for breeding should have a yearly eye exam by a canine ophthalmologist. SAS is a hereditary condition that causes the sudden death of a puppy or young dog; any Fields used for breeding should be examined and declared clear by a competent veterinarian. Ectropion, or loose eyelids, and the much less common entropion, in which the eyelid is turned in towards the eyeball, may also occur. If severe either condition might require surgery. Ask the breeder as many questions as needed to help you make an informed decision as to whether the Field Spaniel is the breed for you and your family. At the very least request information about temperament, hips, eyes, and thyroid of both parents and any siblings of the puppy or dog you are purchasing. The absence of problems in the parents and siblings significantly increases your chances of purchasing a sound, normal dog. Look for a puppy that is outgoing and friendly, with an overall appearance of good health. If possible, try to visit the litter before making your decision. Always have a new animal examined by a vet within 24 to 48 hours to ensure its health.